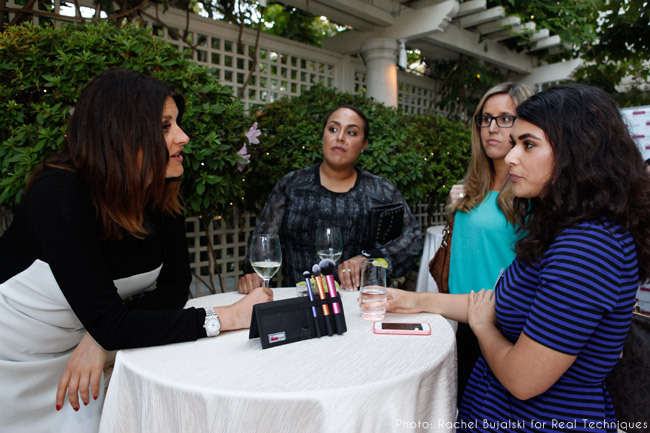 I loved learning about her perspective on makeup and beauty, and wanted to share some tidbits I knew you’d love too. Here are some things I found out about Sam and Real Techniques that I hadn’t known before. 1. She misses doing makeup on shoots. Sam started as a makeup artist, then brought her wisdom to YouTube. 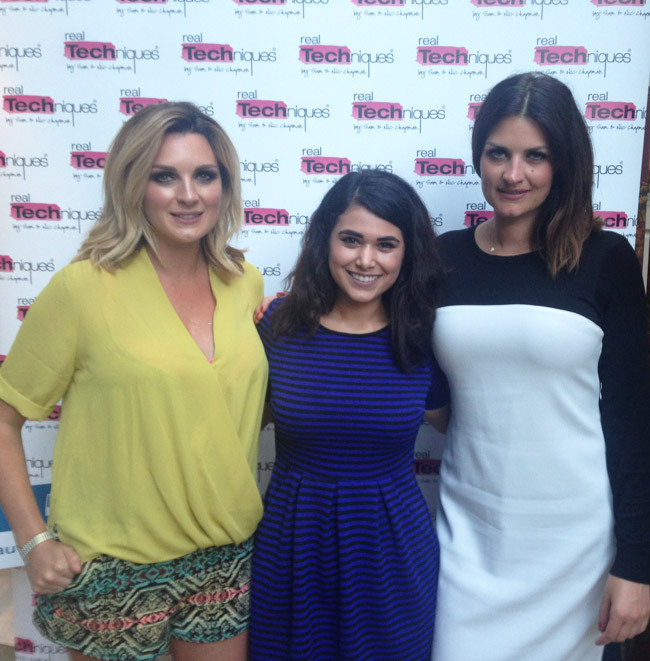 While the pixiwoo channel and Real Techniques now monopolizes her time, she does admit that she misses doing makeup on shoots here and there. She shared with me how she recently made the time to be the makeup artist for a friend on a beach set, which made her miss the good ol’ days. Though, she’s very appreciative of what she has now and is incredibly humble. 2. 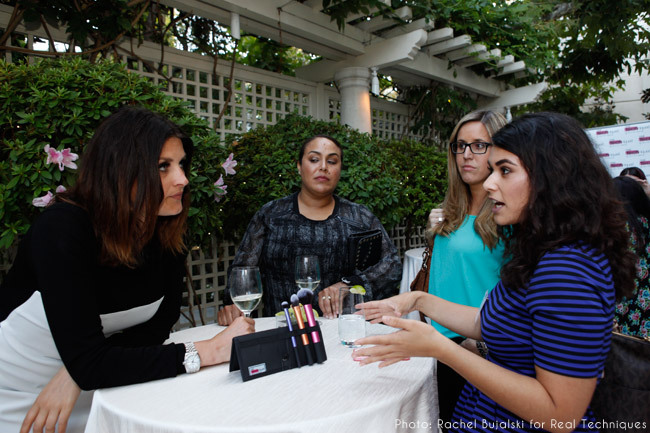 She tells it like it is about beauty trends. 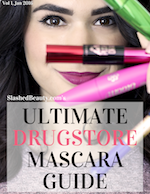 Being an OG beauty authority, Sam can see through all the latest crazes for what they are. “The beauty looks are the same every single season,” she says. “They find different ways to sell them. You know that every summer there’s gonna be dewy skin and a bright lip. Come winter, you know it’s gonna be matte, but they’re probably going to call it velvet because they want to be clever. You get to a certain point when you’ve been doing makeup for a long time when you’re just like… it’s rubbish.” (*cough* STROBING *cough*) As far as her favorite look, she thinks a good black eyeliner can intensify any eye, and is classic. 3. It takes a year for a Real Techniques brush to go from idea to final product. Sam shared that the process of creating brushes isn’t as much as a snap as they make it seem. The sisters typically do research by purchasing a ton of brushes from other brands, brainstorming how they can make them better. Then, after they’ve come up with their ideas, it takes a year for prototypes and final touches to be put on the brushes you end up seeing on the shelves. … but way, way down the line. The sisters want to focus on doing one thing well instead of trying to do it all. Sam said that, if anything, they would consider putting out brow products first. But for now, they are working on expanding the brush line and starting a selection of brush care products. Keep your eyes peeled for perhaps a brush shampoo or spray that will keep your collection clean and working beautifully! 5. Her and Nic didn’t get along growing up. 6. She’s not into perfect makeup. 7. She thinks social media has an effect on self confidence. 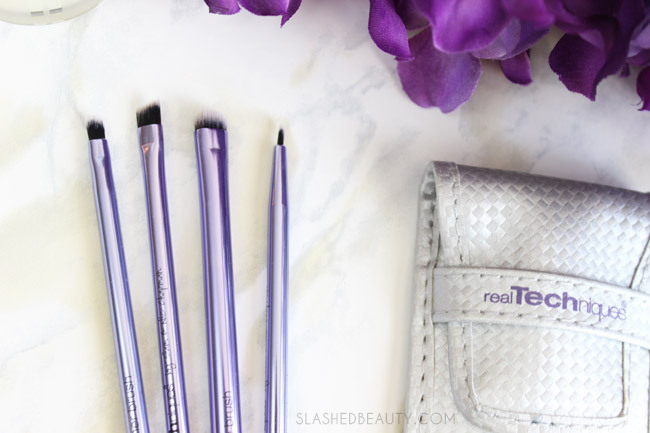 Check out my review of the new releases from the Real Techniques original line as well as their new Bold Metals collection, and enter to win a free Collector’s Edition Eyelining Set over here! What’s your favorite video from pixiwoo? Previous articlePrice Slash Alert: 40% off Sitewide at e.l.f. Wow, how fun to meet these two ladies. I’m not a fan of their brush line .. I think it’s the thick brush handles (love their makeup videos!). I found #2 quite interesting .. but yeah, “strobing” / highlighting .. guess it IS all the same. Cleaver marketing for sure. You’d probably like their Bold Metals collection then, because all the handles are extremely light and tapered for easy handling. They’re so much easier for me to put in my brush holder than the original line! Thanks so much for commenting. I’m almost 46, and I totally agree with #2. 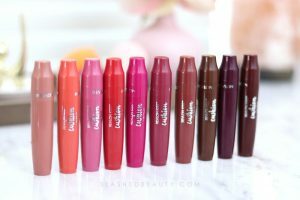 I love RT’s brushes; it would be cool to see a makeup line in the future. I’m glad they don’t want to rush out and just make money off it, that they want to do it right. Yes, it’s what I respect about them the most! They are very thoughtful about what they release!